From rip-and-replace to business as usual, providers differ in this year's EHR upgrades for ICD-10 support, 2014 ONC certification standards. 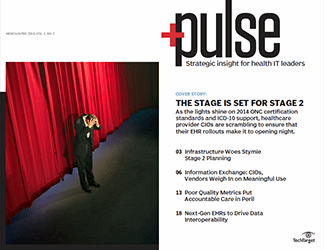 Three provider reps go in-depth in sharing how they are readying their clinical and financial systems for ICD-10 and meaningful use stage 2. Four healthcare systems experts give their best tips on how to prepare for 2014's most challenging regulations: ICD-10 and meaningful use stage 2. Providers are rapidly transitioning to accountable care models, but without better quality measures, these plans may have limited success. Quality metrics and patient-focused care are the cornerstones for providers' plans as they switch to the ACO model. Exclusive preview: A HIMSS analytics health data interoperability report shows HIE participation is stalled on the eve of meaningful use stage 2. With a focus on health data interoperability, the next wave of EHRs will incorporate powers of big data, speech recognition and new database models. Some chief information officers are replacing their EHRs. Add that to coming regulations and the next few years will be full of health IT compliance.